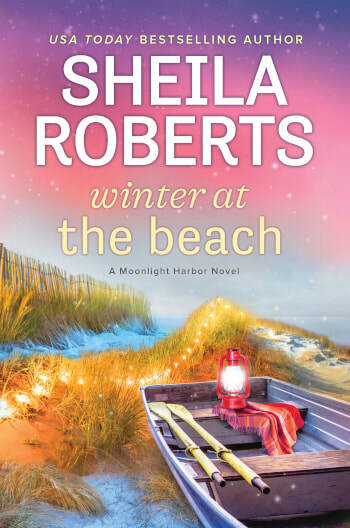 ​Winter at the Beach is available online and in local bookstores. Life at the beach was good. It was even better when you ran a motel and had people staying in it. Lately life at the beach hadn't been quite so good for Jenna Jones, manager of the Driftwood Inn in the beach town of Moonlight Harbor, Washington. Her great-aunt, Edie Patterson, the current owner, had offered Jenna both a home with her and a job after her divorce. Jenna had been grateful for the new start and Aunt Edie had been grateful for the help as the place had fallen into disrepair after the death of her husband, Ralph. Jenna would eventually inherit the motel, which offered her financial security. It had been a win-win deal, and Jenna had whipped the place into shape, decorating on a shoestring, giving the rooms a different theme, depending on what color bargain carpet and what kind of thrift store décor she'd been able to find. The Driftwood Inn was now, if she did say so herself, a charming beach retreat. But she needed more heads in beds. After Labor Day, when summer fun ended and families got busy with school and football season, reservations became scarce. Now, in October, well, if you were looking for a cute vintage motel to stay in, the Drift- wood Inn had plenty of vacancies. This was a problem because Jenna had mouths to feed, people depending on her, including her ex-husband, struggling artist Damien Petit (who wasn't struggling nearly as much as he deserved to be, thanks to the transitional spousal support Jenna paid him every month). More important, she was responsible for her daughter, Sabrina, and her great-aunt. When she wasn't in the office with her friend and right-hand woman, Courtney Moore, or helping their lone maid, Coral, clean rooms, Jenna was working the kinks out of sore muscles. It was a good thing she'd been a massage therapist B.M. (Before Motel). It would give her something to fall back on while money was tight. And it sure was. The next summer's tourist sea- son seemed a long way off. But today was Monday, the beginning of a new week, and this week looked promising. She had clients booked for massages Wednesday, Thursday and Friday, and the Driftwood Inn had guests arriving on Friday afternoon. Which meant they had a reservation for one room in a motel with twenty. That left seventeen to fill as two were permanently taken. And of those two they were only getting money for one. Pete Long, the useless old coot who pretended to be a handyman, paid nothing and did as little as possible to earn his keep. The other room was occupied by Seth Waters, who had proven to be a lot more handy. Unlike cranky old Pete, Seth paid for his room in addition to helping out, and Jenna was glad to have him around. Gorgeous, with muscles growing muscles. Smart and a hard worker, he was also a good listener. But not so good at commitment. Jenna supposed it was understandable considering his past. A rash but noble decision had landed him in prison and he was easing back into his life with leery caution. Which was just as well, Jenna kept telling herself. After her disastrous marriage to the artist who'd made an art out of cheating, she didn't need to rush into love. Although if ever there was a man who made a woman think about rushing, it was Seth. Or Brody Green, successful Realtor and the other man in her life. As a friend. A friend who'd like to be friends with benefits. And she could easily imagine the benefits Brody could offer. Yes, she'd kissed him, too, thanks to too much to drink at dinner, followed by a sunset on the beach with Mr. Suave. Both divorced, both with kids, they had things in common, and Brody was fun to hang out with, but she needed to focus on managing the motel. Which was a heck of a lot easier to manage than her love life. Except it currently had seventeen rooms that needed filling. Things were bound to pick up, Jenna assured herself as she walked across the parking lot from Aunt Edie's house, where she and her daughter, Sabrina, also lived, to the motel office. There was plenty to do on a Monday. Catch up on paperwork, post some new pictures on Instagram, add a new Aunt Edie culinary creation to the Facebook page. Blog about the great weather they were having down at the beach. It's still sunny. Come one, come all. She'd just gotten into the office when Coral pulled up in her dad's truck. Coral was only working part-time. Very part-time. More like barely any time since they didn't have any reservations. She was a sweet girl, nineteen and trying to earn money for college. Jenna wished she could give Coral more hours, but it looked like they were stuck limping along until summer. "Hi," she greeted the girl. "This is a surprise. I didn't expect you in today." "I know." Coral bit her lip. Uh-oh. "What's up?" As if Jenna couldn't guess. "I'm giving my two weeks' notice. I'm sorry," she added, looking as if she'd just confessed to shoplifting. "It's just that, well, I need to be making more money." Didn't they all? "I understand," Jenna said. "I wish we had more work for you." "Me, too." "I'll be happy to give you a good reference." "Oh, you don't have to. I already have a job." Coral's cheeks turned red as a stoplight. "The Oyster Inn." Which was booked solid pretty much all year long. Jenna nodded and forced a smile, told herself not to be jealous of Patricia Whiteside's success. The woman had been in business in Moonlight Harbor forever, and she'd worked hard. She'd gone slightly more upscale with her establishment and it had paid off. The Oyster Inn was as charming as its owner. It boasted a small restaurant and a boutique shop, in addition to great views, and catered to visitors who wanted to enjoy a stay in some- place more high-end. "Well, good. I'm glad," she said. For Coral anyway. For herself, not so much. "I wouldn't have left, really. But..."
"I know," Jenna said. "I get it. No worries, okay?" Coral bit down on her lip again, nodded and then bolted out of the office. Jenna watched her go and sighed. Oh, well. The glass was still half full, right? Now she didn't have to pay someone to clean the rooms. She could probably get by without anyone until spring, and that would save money. Darn it all, she didn't want to save money. She wanted to make money. The phone rang. Someone wanting to make a reservation! She picked it up and sang a cheerful, "You've reached the Driftwood Inn where it's beach time all the time." (Her own clever slogan!) "This is Jenna. How may I help you?" "We have a reservation for this weekend," said a female voice. "Smithers?" Jenna's right eye began to twitch. "Cancel?" "Yes. Something's come up, and we're not going to be able to make it." It was all Jenna could do not to say, "Are you sure?" "You haven't dinged our credit card yet, have you?" "Oh, no. That's only to hold the room." "And we're giving you more than twenty-four hours' notice." "Yes, you are." Good for you. "I'm sorry it didn't work out. I hope you'll be able to come another time," Jenna added, but by then she was talking to dead air. She scowled and left the office to take a walk on the beach, her favorite go-to place when she needed to cogitate. She only had to share it with the seagulls this morning. At eight thirty on a cloudy fall day, no one else was out. There was a serious nip in the air. Hardly surprising, considering the time of year. So stressful when no one was calling to reserve a room. If only Moonlight Harbor had more deciduous trees. Business owners could lure people to town with the promise of seeing the changing colors like Icicle Falls over in the Cascades did every fall. But there was a pre-ponderance of evergreens, both in Moonlight Harbor and on the state highway leading to it. And moss. A lot of moss hanging from trees. Sadly, it didn't change colors. Darn it all. Where were those changing colors when you needed them? She sighed and turned back to the office. Time for another Groupon offer. And time to tell Aunt Edie to start getting creative with stretching the grocery budget. Jenna wasn't the only one frustrated with the tourism slump after the busy summer season. A lack of visitors appeared to be a common lament among the various business owners in town, and was a hot topic with the group of girlfriends who gathered at Aunt Edie's house for their regular Friday night get-together. "We did well this summer," said Cindy Redmond, who, with her husband, Bruce, owned Cindy's Candies. "But it's going to be a long winter." "We do get some people in to storm watch over the winter," Patricia Whiteside reminded her. "Some, but not enough," Cindy said. "There's re- ally not much to lure people down here until March when they come for the razor clam festival. That al- ways brings them in." "Maybe we need something in between," Jenna said thoughtfully. "Yeah, the Bring Your Money and Keep Us Going Festival," cracked Nora Singleton, who owned Good Times Ice Cream Parlor and the funplex. "There's got to be something," Courtney said. She'd been selling her women's clothing creations at the little boutique in the Oyster Inn's lobby and also had a website, but she wasn't making enough to live on yet. Helping Jenna at the reception desk evenings and week- ends not only kept her supplied with fabric, it also kept her supplied with groceries. Another mouth for Jenna to feed. "We'll just do what we've always done," Aunt Edie said. "Hang on until summer. Summer will be here be- fore we know it." Dear, sweet Aunt Edie. Always optimistic. Always clueless. If they hung on any tighter they'd break their fingers. Courtney was right. There had to be something else they could do. "Anyway, it's nice to take advantage of the lull," said Patricia. "Travel, go see family and friends." Which she did every November. Patricia had a sister in Arizona. Patricia also had a healthy bank account and plenty of staff to cover for her. But what about the business owners who weren't in such good shape financially? "We'll have to hunker down and stretch the money," Jenna's friend Tyrella Lamb said to her later as the party was breaking up. Tyrella owned Beach Lumber and Hardware. She, at least, could be sure of customers all year long. "Or come up with a brilliant idea," she added. A brilliant idea. No problem. Jenna waved goodbye to the last of their guests and returned to the living room to find Aunt Edie seated in her favorite seashell chair, twisting the agate ring on her finger. That ring was her aunt's worry stone. "We'll be fine," she told Jenna. Then added, "Won't we?" "Of course, we will," Jenna replied. After everything they'd gone through to bring the motel back to life, no way was she letting it go out of business simply for lack of a few winter visitors. She gave her aunt a hug and patted the covered cage where Jolly Roger, the parrot, was asleep for the night. Then she went upstairs to say good-night to her daughter, who'd been camped out on her bed, texting with her friend Marigold about the new "older man" in her life. Tristan Van Cliburn was a nerd. A very cute nerd, tall and skinny with glasses decorating a face waiting to fill out, along with the rest of him. He was a senior, and Sabrina was only a freshman, a big age difference when you were in high school. But as Sabrina had taken to saying, "Love knows no age limits." Where the heck had she heard that? They'd met when he'd answered an ad Jenna had put in the Beach Times Help Wanted section for a website designer. Sabrina had wandered into the motel office right after Jenna had hired him, and both their hormone centers had lit up like the Fourth of July. Before you could say young love, he was eating lunch with Sabrina and her two new friends, Jennifer and Hudson, every day at school, walking her home, trying to sneak in solitary walks on the beach. Even though he seemed like a nice enough kid, Jenna didn't want her daughter jumping into a relationship with him. Or anyone, for that matter, and becoming sexually active at such a young age. They'd had a mother- daughter talk (okay, more of a mother lecture) but Jenna wasn't sure it had been very effective. It was so much easier to be a mother when your kids were little and you could keep them safely corralled in the backyard. Boys, driving, the dangers of drug and alcohol abuse—so many land mines lay ahead. Ugh. How had she gotten here? How had she wound up with a teenage daughter? Oh, yeah. She'd turned forty. On which one should she blame the gray hair she'd found hiding among the blond highlights the other day—the kid or the big 4-0? "Don't pull it," her mom had advised during their last phone chat. "You pull one and two more come to its funeral." Melody Jones, the expert on gray hair. She'd been dyeing her hair since she was thirty. The advice came too late. Jenna had pulled the thing. She'd heard that gray hair and wisdom went together, but she wasn't ready to be that wise yet. "What are you and Tristan scheming now?" she asked as she kissed the top of Sabrina's head. "Can I go to the Christmas ball with him?" "Yes, when you're a senior. If he isn't engaged to some college brainiac, he can come back from MIT and take you." "That's so not funny," Sabrina said, her sunny smile dipping behind a cloud of teen irritation. "No frowny face," Jenna teased. "Santa's watching." This had been one of Jenna's favorite behavioral modification tactics, starting when Sabrina was four, and she'd used it plenty over the years, working it from November clear up to December 24. "Lame, Mom," said Sabrina, who'd quit believing in Santa when she was nine. "Anyway, it's only October. You're way too early." "I like to get an early start." Obviously, so did Tristan. "Mom." Every mother knew that tone of voice, half disgust and half pleading. "Maybe. Let me think about it." Sabrina beamed at her. "That would be the best Christmas present ever." "We'll have a great Christmas, no matter what," Jenna said, determined not to make any promises until she'd had more time to consider. She gave her daughter another kiss, then headed for her own room. Christmas. It was her favorite holiday. The joy, the lights, the parties, the hopeful message of peace on earth, goodwill toward men. She loved the candlelight church services, the cookies, the decorations and holiday songs, the gathering of family. Granted, her own little family had been fractured, but she still had her daughter and her mom and sister, and Aunt Edie, and she was looking forward to enjoying their first Christ- mas together in their new home at the beach. Her mom and Celeste, who both lived north of Seattle, would come down, and it would be one long party. The beach was always special, but even more so during the holidays. Christmas at the beach. Hmm. Now, there was a thought. Where could she go with it? Someplace good, she realized as she crawled into bed. A holiday festival was bound to lure people to town. Who didn't like fairs and festivals, especially holiday ones? She could see it now—the storefronts all lit up with multicolored lights, trees in the restaurants decorated with glittery shells and little lighthouses and mermaids, amusement rides and cotton candy and hot chocolate down at the pier, a live Nativity scene in front of one of the churches. And a Christmas parade with Santa bringing up the rear for a grand finale. You had to include Santa. In fact, the jolly old guy was such a draw, maybe they could include his name in the festival. Sandy Claus? No, that was too close to Sandy Claws, the pet goodies shop. Santa in the Sand? That sounded like he'd gotten his sleigh stuck. Santa at Sea. Sea, seaside... Seaside with Santa! Oh, that had a nice ring to it. Come to Moonlight Harbor and experience the Seaside with Santa Festival. Waves of fun! Damien had always looked down his snobby artist nose at her various craft projects. She supposed she'd brought that on herself since when they first met she was the little crafter going to massage therapy school and he was the darling of the University of Washing- ton's art department. But after a while it got old hear- ing, "You're just not creative, Jenna. Not everybody is, you know." Right. Not everybody was as brilliant and special as him. But guess what, Damien. Your former wife is more creative than you ever realized. And she's not mooching off her ex and sitting around making collages out of take-out containers. She's coming up with something to help a whole town. Jenna smiled and snuggled under the covers, letting the sound of the surf lull her to sleep. Tomorrow at the Moonlight Harbor Chamber of Commerce meeting she was going to propose her brilliant plan. Look out, Icicle Falls. You've got competition.